The U.S. Department of Agriculture’s (USDA) National Institute of Food and Agriculture (NIFA) announced awards to combat citrus greening disease. The funding to support research and Extension programs is made through the emergency Citrus Disease Research and Extension Program (CDRE). CDRE was authorized as part of the 2014 Farm Bill. Florida’s citrus industry has lost nearly half of its $1.5 billion on-tree fruit value in just 10 years due to citrus greening disease. CDRE supports research and Extension activities, technical assistance and development activities to combat citrus diseases and pests, including citrus greening, and the Asian citrus psyllid (ACP) — the insect that transmits the disease. CDRE also supports the dissemination and commercialization of relevant information, techniques, and technologies that target problems caused by citrus production diseases and invasive pests. The grants announced today include a University of Florida project that will develop ACP detection systems, hydroponics and sensor-based irrigation, integrated pest management with biocontrol, and economic analysis to support citrus trees grown under protective screen structures. They also include an Agriculture Research Service (ARS) project that will develop citrus fruiting hybrids that are tolerant or resistant to citrus greening disease to help revitalize Florida’s citrus industry. Previously funded projects include a University of Central Florida project to develop a system to deliver a natural clay-based, film-forming ACP repellent material that also contains two potent bactericides. 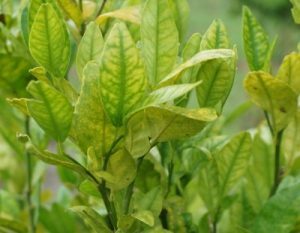 University of Florida researchers are delivering zinc nano-particles into citrus phloem where it has been shown to be lethal to the bacterium that causes huanglongbing. NIFA reviews all competitive grant proposals through an external peer-review process in which a panel of experts from within the respective field takes part. Specific details on panel meetings, review formats and evaluation criteria may vary among programs. NIFA’s mission is to invest in and advance agricultural research, education and Extension to solve societal challenges. NIFA’s investments in transformative science directly support the long-term prosperity and global preeminence of U.S. agriculture. To learn more about NIFA’s impact on agricultural sciences, visit https://www.nifa.usda.gov/Impacts, sign up for e-mail updates or follow NIFA on Twitter @USDA_NIFA, #NIFAImpacts.